Our Colorado river front vacation rental homes are located minutes from Laughlin, Bullhead City and Lake Havasu in near by Mohave Valley, AZ. This vacation rental property contains park like settings with manicured lawn. Many palm trees accented with night-lights located throughout grounds. River rentals also feature private docks with parking for boats and personal water craft. Both Colorado river rental homes feature central air & heat and are fully furnished including all appliances, washer & dryer, TV’s and outdoor charcoal BBQ. Homes have an incredible view of the Colorado river and mountains and are located only a few feet from the water. Accommodations: 3 Bedrooms, 2 Baths (Sleeps 10) 1900 sqft. Accommodations: 4 Bedrooms, 3 Baths (Sleeps 12) 4000 sqft. The main attraction is, of course, the Colorado River. You can play in the river all day under the warm Arizona sun. 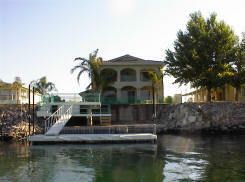 If you have your own boat or Jet Ski you can use the private dock on our Colorado River vacation rentals. Once the sun sets you can hit the town. Laughlin - Laughlin is a family-friendly destination and, being located on the river, it emphasizes activities on the Colorado River. Many of the casinos that line the Colorado River are linked by a walkway known as the Laughlin Riverwalk. Laughlin is the third largest resort and casino city in Nevada next to Las Vegas and Reno. There are nine hotel/casinos and one motel in Laughlin providing over 10,000 rooms, 94,000 square feet of meeting space, 60 restaurants, two museums, a 34-lane bowling center and a variety of boutiques, spas and salons. Over 3 million people visit Laughlin annually. This is the best place to visit if you want a family atmosphere, enjoy water sports, nightlife and gambling. 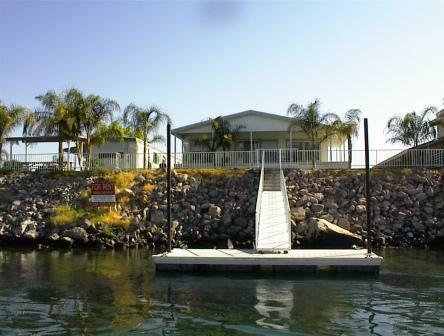 Our Colorado River rental homes are just driving distance away from Laughlin. Bullhead City – Bullhead City is located across the Colorado River from Laughlin, Nevada. Bullhead is home of hundreds of acres of city-operated parks. Ken Fovargue Park is a big park that has bike trails, baseball fields, a playground, a swimming pool with waterslide and lighted basketball courts. Rotary Park is the largest city park on this side of the Colorado River. It covers 300 acres of riverfront property. It has beaches with ramadas and barbecues, a jetty for fishing with a fish cleaning station, boat launching ramps, a complete lighted sports complex that hosts regional tournaments and competitions, and a skateboard park. Our Colorado River rental homes are just driving distance away from Bullhead City. Lake Havasu – "The personal watercraft capital of the world." Lake Havasu is an amazing 45 mile long playground stunning shoreline, sandy beaches, secluded coves and cool water. If you're looking for a relaxing day filled with sunny skies and warm, dry air. You can enjoy kayaking, boating, jet skiing, water skiing, fishing, and house boating. Over 2 million visitors flock to the area each year to enjoy exploring, and photographing the quiet, jaw-dropping spectacular scenery amid the drama of a desert habitat. Lake Havasu has many hiking trails and campsites with hundreds of boat access only campsites along the scenic shores. There are many spots for bird watching and amazing canyon walls for exploring Indian petroglyphs. A 13-mile section of the Colorado River, known as Topock Gorge, protects desert bighorn sheep, wild burros, bald eagles and peregrine falcons. On the sheer canyon walls, prehistoric Indians chiseled petroglyphs, estimated to be between 1,500 and 2,000 years old. Fishing is also a great attraction at Lake Havasu. The deep waters provide for black and striped bass, crappie, bluegill, catfish and trout. A big advantage of renting directly from the property owner is that no one knows the property better than the person who owns it. Any questions you have concerning the property can be answered quickly by the owner as opposed to a management company that might have to contact the owner first to get the answer. Property owners can be a very valuable asset for making a good vacation a great one. The owner can provide you with more accurate information about the property than a property management company because the owner is obviously more familiar with the house. Many vacation rental property owners live in the area where they are renting. This can be a valuable resource because the owner can give you inside information about the area. The owner may be able to let you in on where the restaurant specials are or where to go for entertainment. They can also clue you in to the local laws and customs to help you feel less like a tourist. Most property management companies have set rates with no room for negotiating. Dealing directly with the owner offers much more flexibility because it eliminates the middle man. If you notice the owners reservation calendar mostly empty during the dates you plan on vacationing, you may be able to negotiate a discount. Vacation rentals by owner properties can be offered at a cheap price compared to those run by a property management company because they are not sharing a percentage of their rental income. Full service property management companies can charge anywhere from 10 to 22 percent for service fees. Many companies also have hidden charges; reservation fees, cleaning and linen fees, credit check fees and so forth. By dealing directly with the owner you can bypass many of these charges. Talk with the owner about bringing your own linens and some amenities and save money. The owner may be more flexible regarding check-in and check-out times. Most property management companies are very strict about these times and many of them charge hefty penalties for late check-outs. So don't wait contact us today: info@onthewaterrentals.com.